0 to 62mph. OFFICIAL. : 2011 Mercedes Guard (Part 5/5): Over 8 Decades of Experience! 2011 Mercedes Guard (Part 5/5): Over 8 Decades of Experience! Mercedes-Benz has never seen any contradiction between innovation and tradition. On the contrary, as the inventor of the automobile, the world's oldest automaker has always felt a special obligation to drive forward the development of automotive technology at the highest level and to keep on setting new standards for the industry. 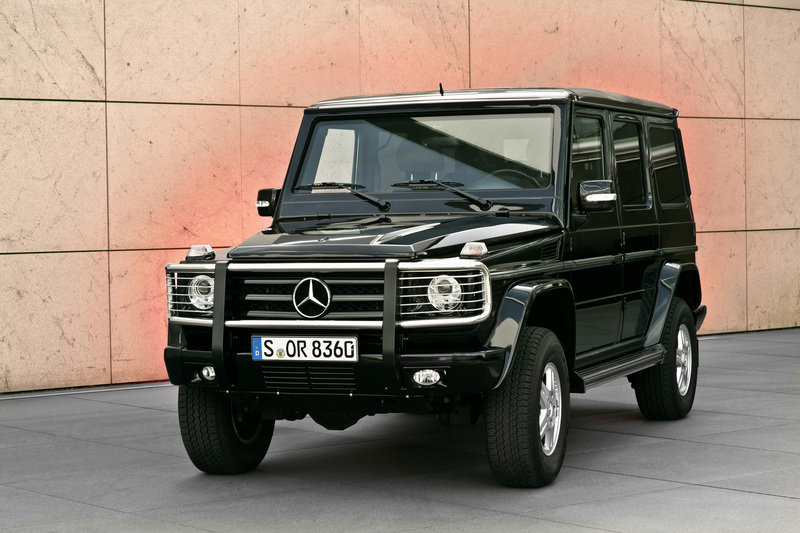 This demanding objective which Mercedes-Benz has set itself also applies to its armoured special-protection vehicles, as is demonstrated by the Stuttgart-based premium brand's unique track record in this field. As early as 1928, with a vehicle based on the Nürburg 460 model, Daimler-Benz became the first company to factory-fit vehicles with special protective elements designed to provide the occupants with effective protection against attack with firearms and explosives. 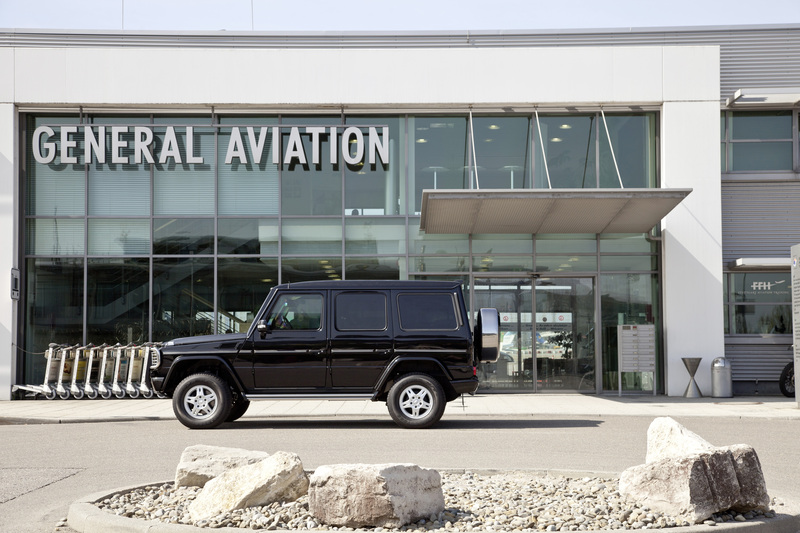 This was the start of eight decades of extensive materials testing, focused development and continuous improvement, during much of which Mercedes-Benz enjoyed a unique position in the field of special-protection vehicles and acquired a reputation as the specialist of choice in this field. Following the Nürburg 460 model of 1928, Mercedes-Benz went on to develop special-protection variants of its successors in the luxury prestige segment – the 770 (W07) "Grand Mercedes" and the 500 model. 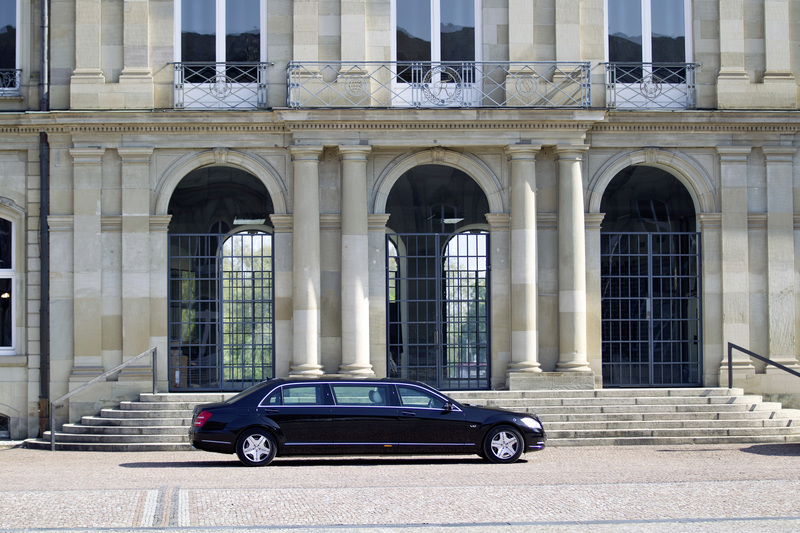 Japanese Emperor Hirohito personally selected an armoured "Grand Mercedes" as a vehicle befitting his status – this limousine, which was delivered in 1935, can now be seen in the Mercedes-Benz Museum in Untertürkheim. Many politicians and heads of state followed the Emperor's example and placed their trust in Mercedes-Benz special-protection vehicles. From 1965, Mercedes-Benz offered numerous special-protection models. The legendary Mercedes-Benz 600 in limousine and Pullman limousine guise was followed during the 1970s and 1980s by the 280 SEL 3.5 and a wide range of S-Class V8 models: the 350 SE/SEL and 450 SE/SEL, and then the 380 SE/SEL to 560 SEL models. 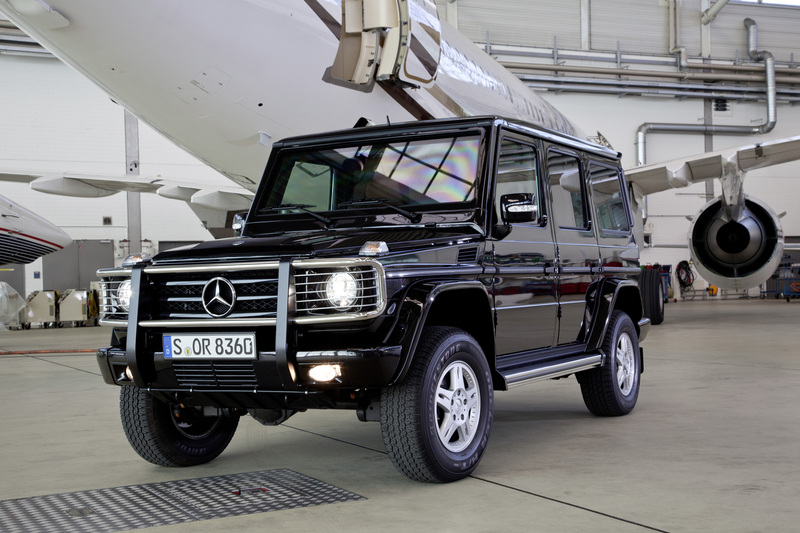 Since 1979, Mercedes-Benz has also built special-protection versions of the G‑Class. 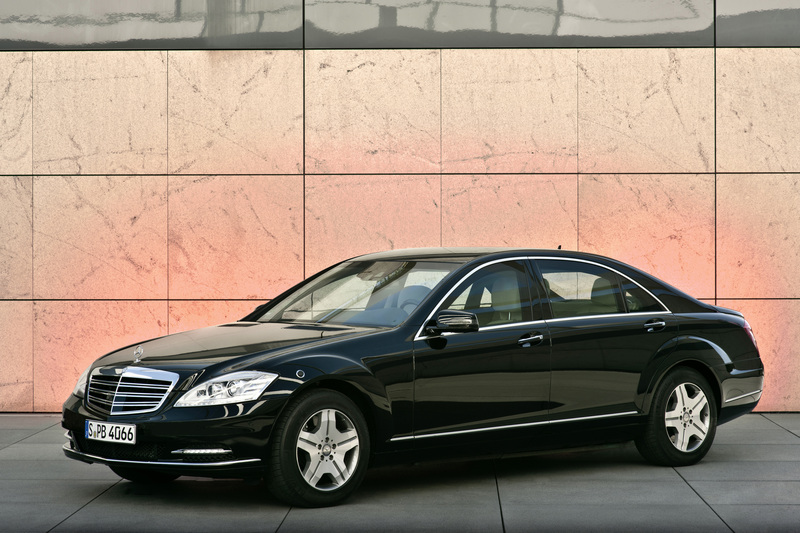 Today customers have a choice of protection levels in the E-Guard, G‑Guard, S-Guard and the Mercedes-Benz S 600 Pullman Guard. The first special-protection models from Mercedes-Benz differed from those of later years not only with regard to their design and performance, but also in terms of their technical basis. Instead of having a self-supporting body structure, which is now the norm, their bodies were mounted on strong frames. The weight of the protective steel plates therefore called for less extensive design changes than is currently the case. This was also true of the very first Mercedes-Benz vehicle with factory-integrated special protection, the Nürburg 460 (W 08) of 1928, which has already been mentioned. Unfortunately, there are no longer any documents which describe the technical details of this first special-protection vehicle. All that is known, thanks to contemporary archive photographs, is that a Pullman limousine of this type built in 1931 was armoured with sliding steel plates which allowed the window areas to be shielded from the inside. The windscreen was protected by a folding steel plate with only a small observation slit provided for the driver to see through when it was in use. As for the passengers, a roof-mounted periscope allowed them to survey their surroundings when the protective plates were deployed. A Pullman limousine version of a model 500 (W 08), a later variant of the Nürburg, is still in existence today. The doors and windows of this vehicle, which was delivered to Japan in 1937, are protected on the basis of the same principles which apply today. The next vehicle which Mercedes-Benz offered in a version with factory-integrated armour was the model 770 "Grand Mercedes" which was launched in 1930. Notable characteristics of this model included rigid front and rear axles, which were attached to a ladder frame consisting of U-section‑profiles by means of semi-elliptical springs, as well as a 7.7-litre eight-cylinder in-line engine with an output of 150 hp (200 hp with a supercharger). Between March 1932 and January 1935, the Japanese imperial court took delivery of at least six "Grand Mercedes" models in Pullman limousine guise. At least one of them was armoured, and has been in the Mercedes-Benz Museum collection since 1971. An enhanced version of the "Grand Mercedes" with a sophisticated swing-axle suspension was presented in 1938. The perimeter frame of this model consisted of thin-section oval tubes which combined great rigidity with low weight. Independent double-wishbone front suspension and‑a rear De Dion axle represented additional improvements. The engine, the technical characteristics of which were largely based on the preceding model, developed 230 hp with a supercharger. The "Grand Mercedes" was officially available as a Pullman limousine, as Cabriolet D and Cabriolet F models and as an open touring car. A number of special armoured versions of each of these body variants were built. Furthermore, the state commissioned armoured four-door limousines between June 1943 and July 1944. Whereas the permissible gross vehicle weight of the standard cars was 4200 kg, this figure increased to as much as 5420 kg in the case of the armoured versions. However, the maximum speed of the latter was reduced from 170 km/h to 80 km/h in order to maintain the service life of the tyres. Featuring a greater displacement and higher power output, the elegant, luxurious and sporty 540 K was the successor to the 500 K. Both models were aimed at a demanding, performance-oriented clientele and, as was usual at the time, were available in many different body variants – as saloons, roadsters, in various cabriolet versions and as open touring cars. Moreover, two-door armoured saloon versions were built for the Reich Chancellery and delivered between November 1942 and February 1943. At least one example of this two-door special-protection saloon survived the turmoil of the final years of the war and the immediate post-war period, and has been on show in the Technical Museum in Prague for many years. In September 1963, Mercedes-Benz presented a new, exclusive prestige vehicle to meet the requirements of the most demanding customers – the 600 model which became an instant legend. 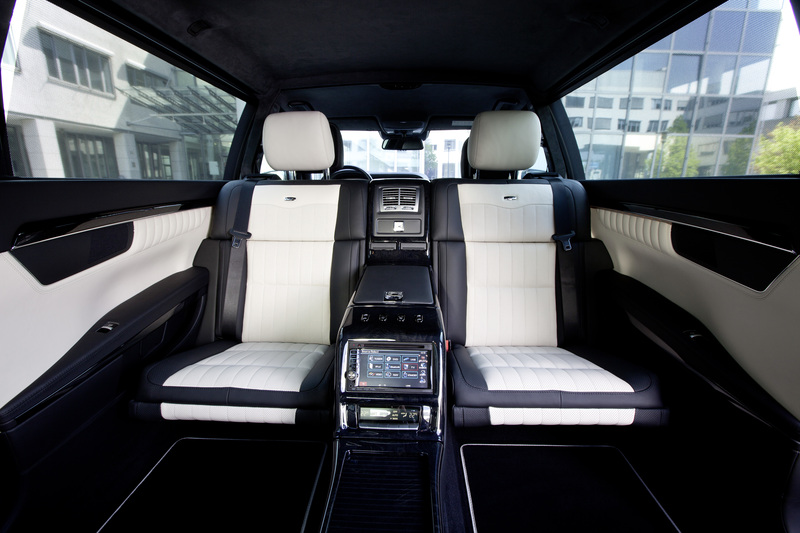 It was outstanding in every respect – generous dimensions, majestic design and exceptional technical characteristics. Its V8‑injection engine developed 250 hp from a displacement of 6.3 litres and allowed the almost two-and-a-half-tonne vehicle to attain a top speed of more than 205 km/h with a 0 to 100 km/h acceleration time of ten seconds. The standard-fit air suspension, whose shock absorbers could be adjusted from the steering column while the vehicle was moving, ensured excellent ride comfort. The Type 600 was available as a five to six-seater limousine with a 3200 mm wheelbase and also in several Pullman variants with a wheelbase of 3900 mm. It was only a short time after the launch of the top-of-the-range model that the German government asked Daimler-Benz AG to build an armoured version for state visitors. Although Mercedes-Benz had a remarkable track record in building special-protection vehicles, this on its own was not enough as the technical fundamentals had changed dramatically, not least because of the adoption of the self-supporting body. As a result, the engineers and materials experts at Mercedes-Benz embarked on nothing less than the reinvention of the concept of special protection. Thus it was that a small team set out to develop a new approach. In May 1964, at the Sindelfingen plant, they conducted the first armour tests with new steel grades and prepared the first design drawings. They eventually decided on high-alloyed steel grades, using double layers in certain situations and weight-saving ceramics for some flat-surfaced components. 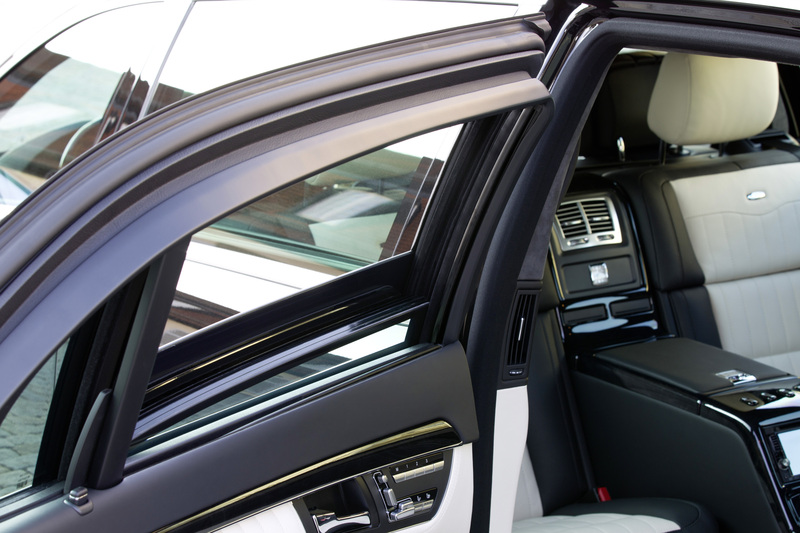 At the same time, working with a glass manufacturer experienced in equipping banks, they came up with a solution for the windows, the vehicle requiring not only a curved windscreen, but a curved rear window, too. 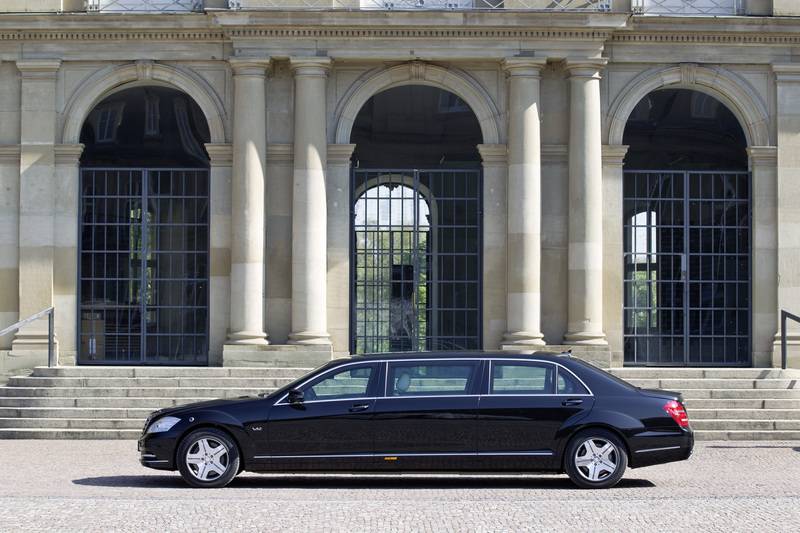 In June 1965, a bullet-resistant Pullman limousine was produced – the first special-protection vehicle built by Daimler-Benz since the war. Working under the pressure of an extremely tight schedule, the company managed to complete it just in time for the state visit of Queen Elizabeth II. The armoured Pullman limousine had a raised roof element so that Her Majesty did not have to remove her hat. This generous headroom subsequently benefited other state visitors, many of whom wore hats in those days. 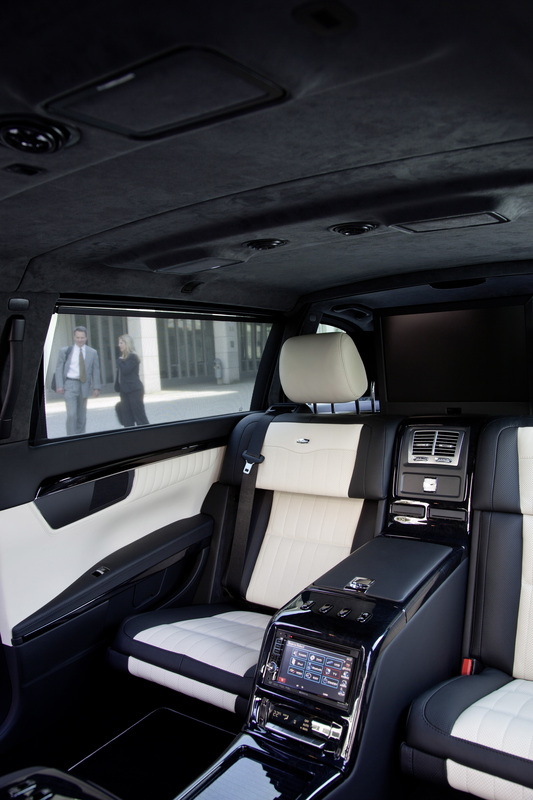 To make it easier to open the doors, whose weight had increased dramatically because of the protective elements, the engineers installed a hydraulic system for the rear compartment. It was activated at the touch of a small button housed in the door handle recess – security staff and hotel doormen were instructed accordingly. Along with a number of "normal" Pullman limousines, this vehicle remained in the company's fleet, ready to be hired to the government or other users when required. A second version of this special variant was built in 1980. This, too, spent its working life in the company's fleet before joining the Mercedes-Benz Classic vehicle collection. On special request, Type 600 limousines and Pullman limousines were also built with special protection for private customers. Between May 1971 and November 1980, several special-protection 600 models were built. However, unlike the two vehicles in the company fleet, these models had a standard-height roof. After the model 600, which was built as a one-off, Daimler-Benz initially gave no further consideration to the production of special-protection models. This changed in 1970 when several diplomats in Latin America were attacked, kidnapped, and, in some cases, murdered. The German foreign office felt it necessary to provide a number of its heads of mission with specially protected vehicles. Several German federal authorities suggested that Daimler-Benz should build armoured vehicles as the comfortable, reliable and powerful limousines from Stuttgart were highly regarded by many governments – a reputation which had been established by the Type 300 – popularly known as the "Adenauer" – in the 1950s. The result was the special-protection model 280 SEL 3.5, which was produced between May 1971 and September 1972. Most of these vehicles were delivered to Germany's foreign missions judged to be at particular risk, while the remainder went to governments and at-risk politicians abroad. The attacks by the RAF terrorist group in the 1970s led to a sharp increase in demand for protected vehicles. 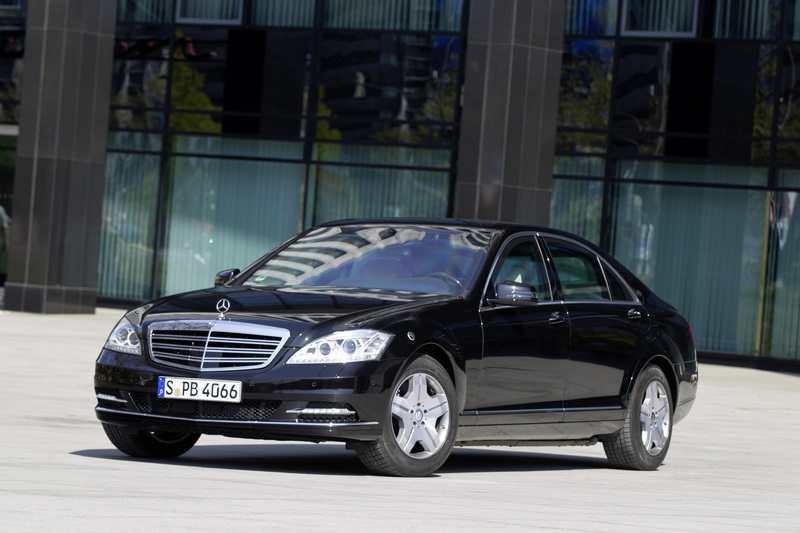 Daimler-Benz therefore decided that the all-new luxury-class generation – with the internal model-series designation W 116 – which was launched in September 1972 should also be offered in the form of a special-protection variant. The company's experts built on the experience they had acquired developing the special-protection 280 SEL 3.5 and improved the protection technology continuously. 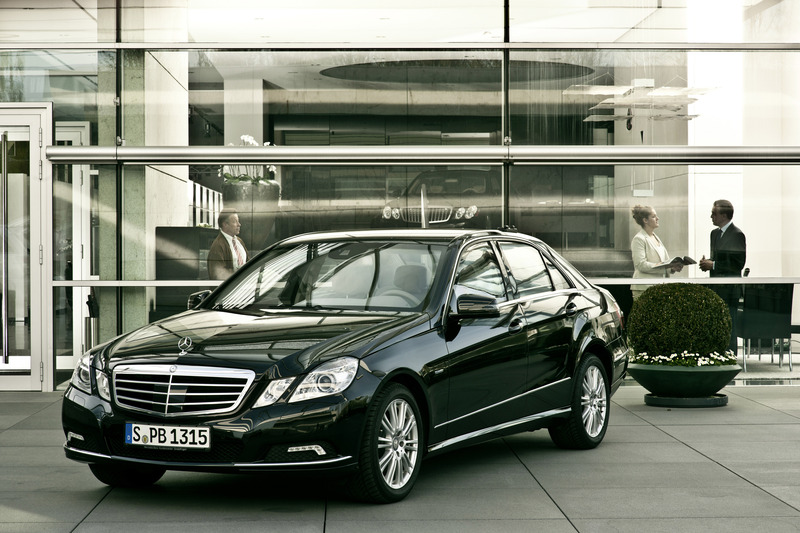 The special-protection variants of the eight-cylinder 350 SE, 350 SEL, 450 SE and 450 SEL models were supplied to a select group of customers, including many government bodies in Europe and overseas. In order to provide even greater protection from projectiles and explosives, the authorities and Daimler-Benz resolved to work together closely during the subsequent years – indeed, this relationship continues to this day – as no other German car manufacturer was able to offer special-protection vehicles at the time. Together, they developed appropriate and feasible technical standards. The Mercedes-Benz engineers began by testing individual components for their suitability. In the next phase, complete vehicles were tested by firing different types of ammunition at them in various conditions. Finally, the vehicles were also subjected to testing with explosives. Daimler-Benz established its own firing range in 1983. The results of these tests were used to prepare requirement profiles for different situations – examples being opportunistic crimes such as attacks while cars are waiting at traffic lights, robberies committed using small arms and terrorist attacks with military weapons. This phase was conducted by the official ballistics authorities and Mercedes-Benz specialists who were responsible for many technical innovations. These first technical descriptions formed the basis for today's test regulations for the different resistance levels. 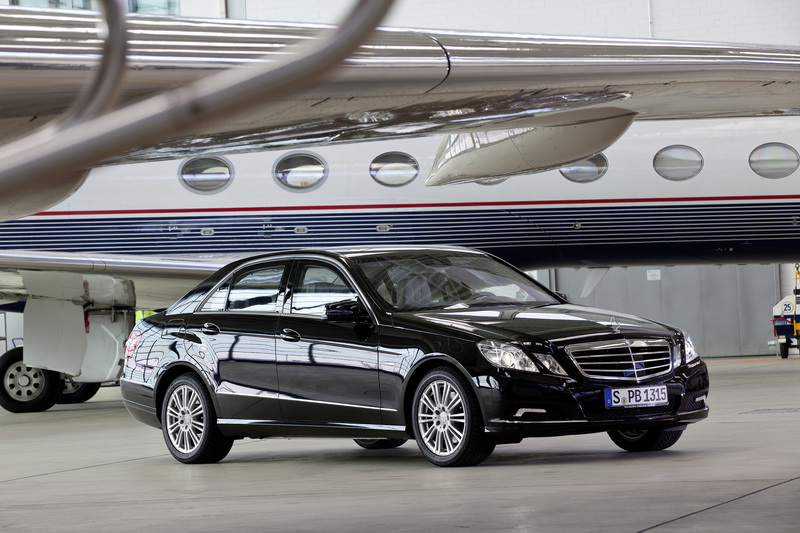 Enhanced special-protection technology resulting from an intensive development programme was available for the new generation of the S-Class which was launched in 1979. Particular mention should be made of two 500 SEL models which were built with a 200 mm longer wheelbase and a 30 mm higher roof element. The first one, which was completed in January 1983, joined the company's own fleet of prestige vehicles. The second limousine was built at the request of the Vatican for the Holy Father and was presented to Pope John Paul II in August 1985. In March 1991 the 140 series was presented at the Geneva Motor Show as the successor to the 126 series, though the last examples of the 126 series with special protection were not completed until April 1992. From February 1992 the 140 series saloons also became available with special protection – powered by a 5.0-litre V8 or 6.0-litre‑V12 engine. The completely newly developed V12 was the first series-production twelve-cylinder car engine from Mercedes-Benz, and with a rated output of 300 kW (408 hp) it was also the most powerful Mercedes-Benz passenger car engine. 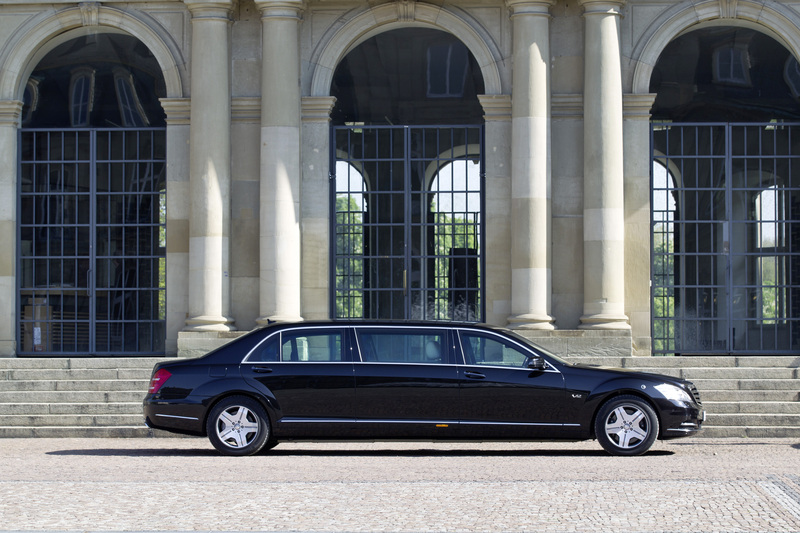 In a surprise move in September 1995, Mercedes-Benz unveiled the S 600 Pullman Guard which it had developed as a new state limousine with special-protection technology – the latest in a long tradition of such vehicles from Mercedes-Benz. 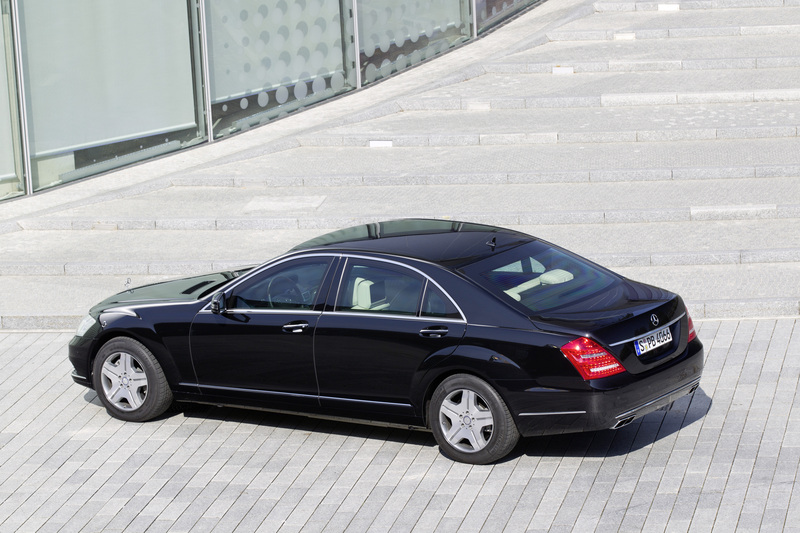 At 6213 mm long, this specially built model was exactly one metre longer than the long-wheelbase S 600. The extra length benefited the rear passengers, who were accommodated on comfortable‑opposed‑seats and could separate their rear compartment from the driver's area by means of a partition. 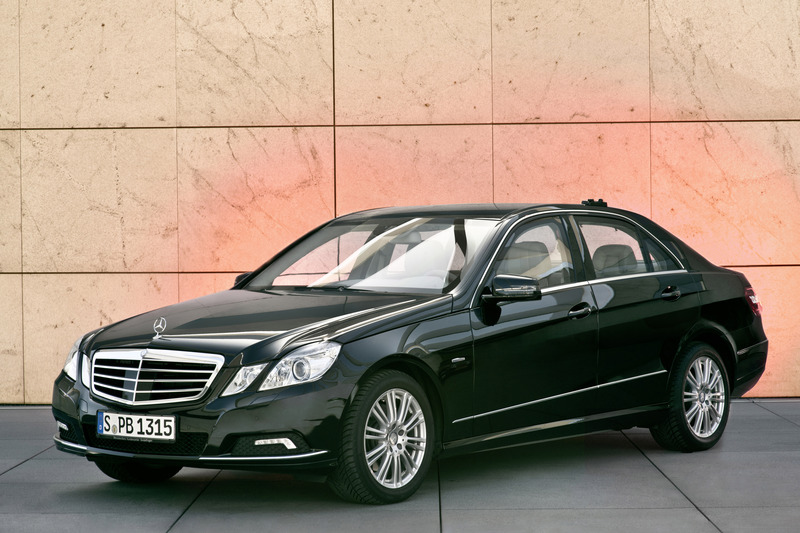 September 1998 saw Mercedes-Benz launch the 220 series S-Class Saloon. True to the company's decades-long tradition, this generation of the S-Class had once again been designed as a large touring saloon with superior ride comfort, a high level of passive safety and effortlessly superior performance. It differed from its predecessor principally in terms of its reduced exterior dimensions, a new, slimmer design and over 30 technical innovations which once again made the Mercedes-Benz S-Class the trailblazer for the whole spectrum of passenger-car technology. 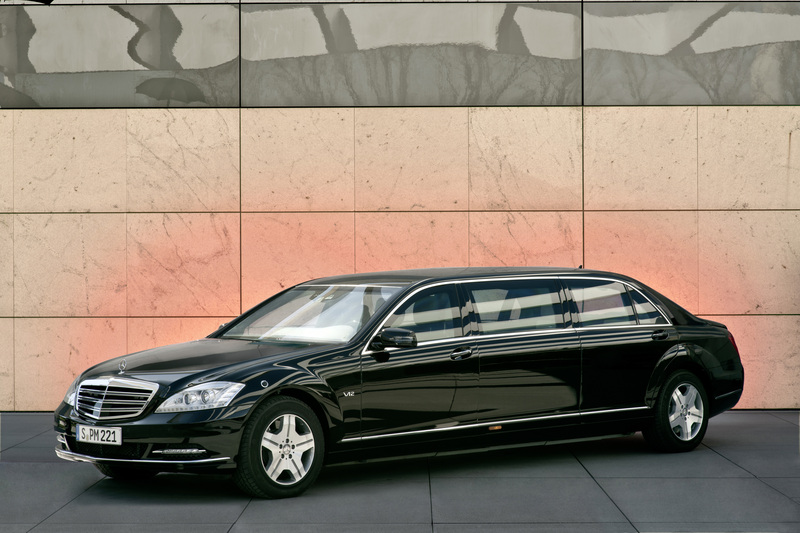 From 2000 Mercedes-Benz also offered this S-Class generation with a long wheelbase and in several special protection versions. 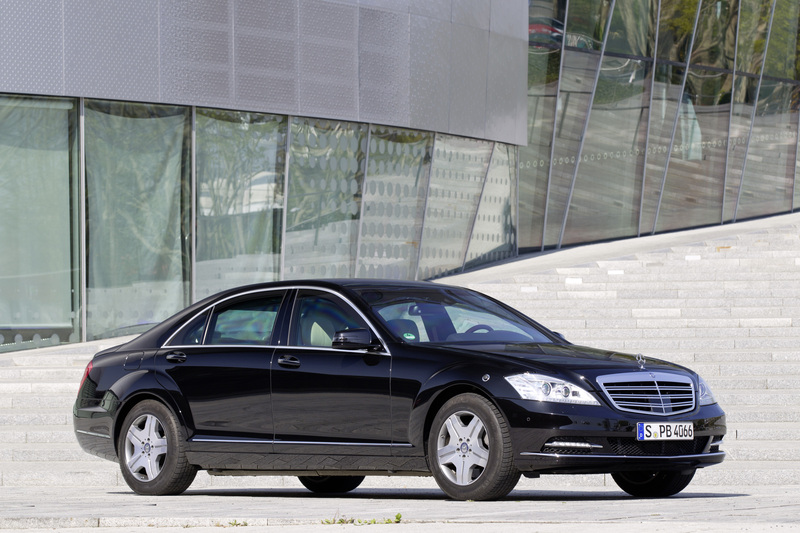 These included the long-wheelbase versions of the S 500 and S 600 – both with highest protection (VR6/VR7). 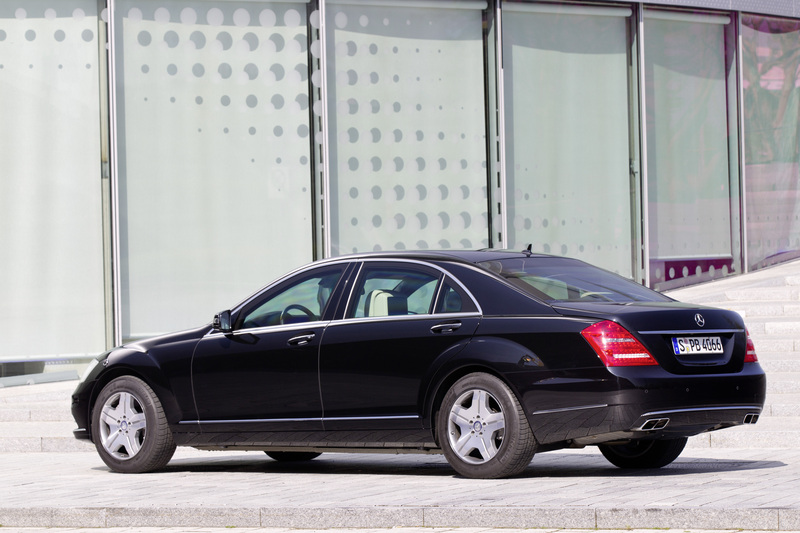 In 2004 the S 500 Pullman – also with highest protection (VR6/VR7) – was added to the special-protection models in this S-Class generation. 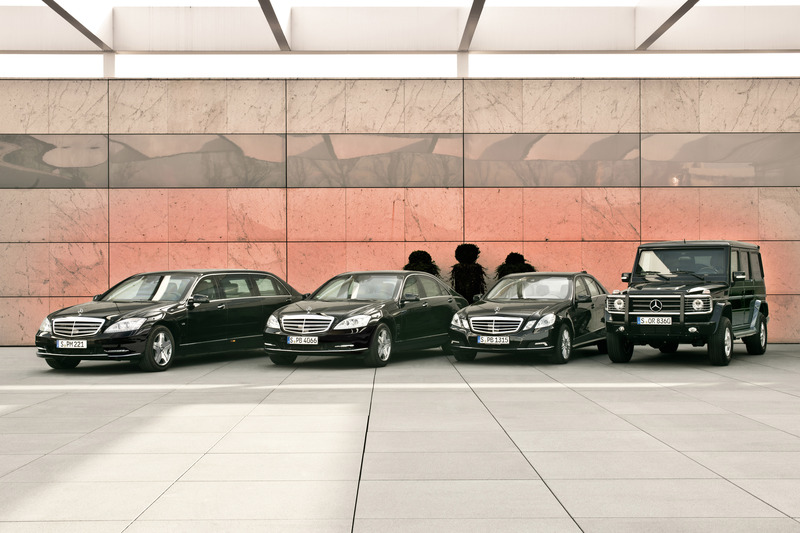 Since 1995, Mercedes-Benz has offered special-protection limousines not only in S-Guard form but as E-Guard models too. This variant is a response to the growing demand in the upper medium-size category, and meets the requirements of those customer groups whose members have a need for greater protection but wish to drive their vehicles themselves. In order to deliver the desired performance despite the considerable additional weight of the protective elements, only the most powerful models were offered. From March 1997, an additional version with lighter protection – with a VR4 protection level – was made available in order to offer a very large degree of protection from handguns. This variant was also offered with a 3.2-litre V6 engine. 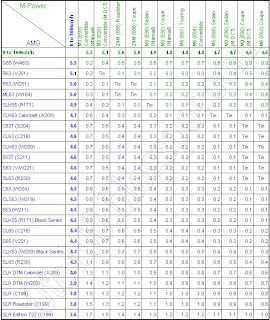 As in the case of the vehicles with a VR6 resistance rating, the protective elements were integrated seamlessly into the body structure in the course of the production process. These vehicles thus benefited from factory-integrated protection of a standard which is impossible to achieve by retrofitting special protection elements. 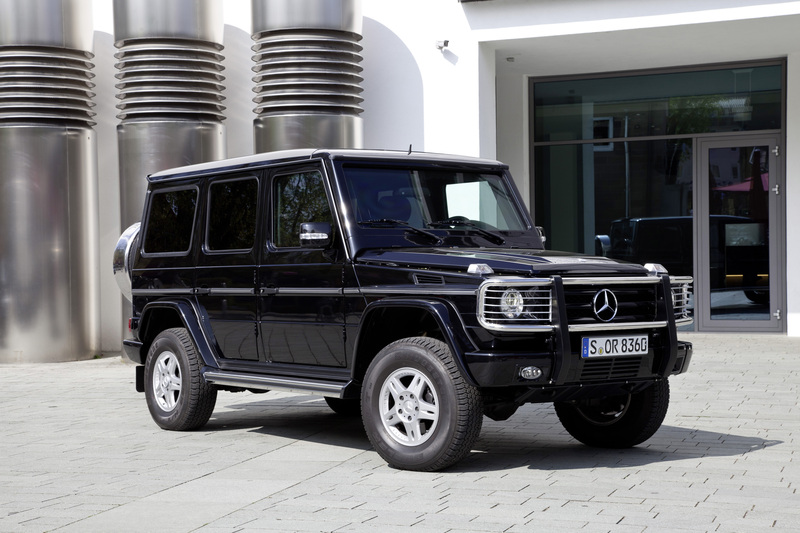 Shortly after its launch in 1979, the Mercedes-Benz G-Class model was also offered in a special-protection version. 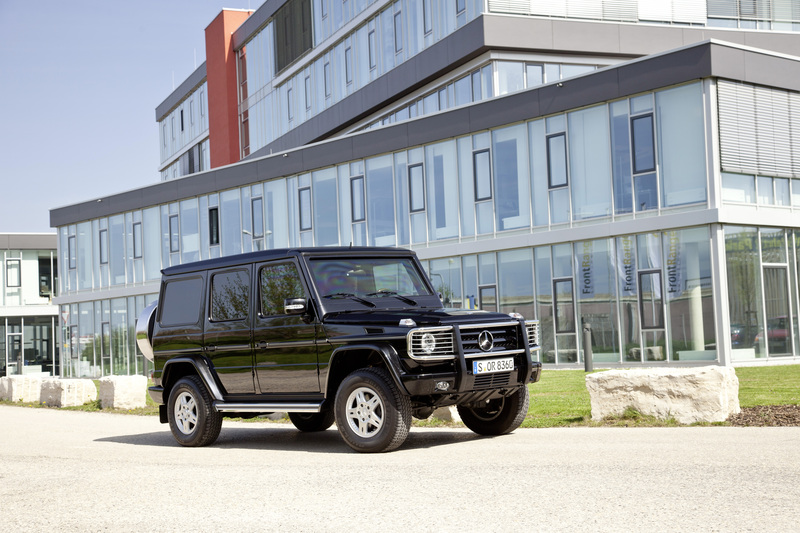 Although it has undergone technical enhancements over the years, the G-Guard still forms part of the portfolio of Mercedes-Benz Guard special-protection vehicles – as do the S-Guard and E‑Guard models in their respective latest versions. Entirely hand-crafted in the "Manufaktur"
Daimler-Benz had its first post-war special-protection vehicles built in the prototyping department as this offered the full range of facilities for the manufacture of one-off vehicles. Specialists in modelmaking and bodyshell construction were to be found here, as well as experts in the fields of suspension systems, engines and vehicle electrics. A paint shop and upholstery shop completed the line-up. As demand increased, these facilities were extended to form the current special-protection production line. In order to meet many of the customer requirements – some of them quite out of the ordinary – the specialists crafted and assembled components entirely by hand. A case in point was a vehicle built for the Pope on the basis of a W 126 S‑Class model. The biggest problem encountered in building this vehicle, which featured a sliding roof and a seat mounted on an extending pedestal, was presented by the need to drill holes in the C-pillars in order to attach the Papal emblem. Normal steel drills were rendered useless because the interior of the pillar was reinforced with high-alloyed steel. The workshop team eventually resorted to special tungsten drills but it still took two days to drill the fixing holes. Russian presidents also presented the special-protection team with some difficult challenges. In 1997, for example, a special-protection S 600 Pullman was to be equipped with a Russian communications system. However, the presence of the special-protection elements meant that only a limited amount of installation space was available – no more than ten centimetres between the boot lid and the equipment concerned. Working with Russian engineers, the team was able to find a solution and deliver the vehicle to Russia on schedule. 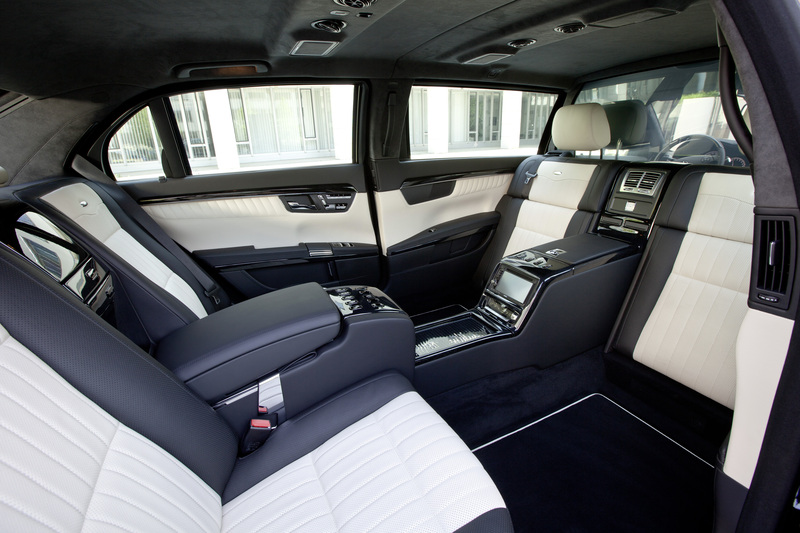 Meeting other requirements – such as an extra-large ashtray, various entry aids, including wheelchair access systems, vehicles with running boards and roof handles for bodyguards – proved comparatively straightforward. Eduard Shevardnadze, the former foreign minister of the Soviet Union and later President of Georgia, was so impressed by the work of the special-protection team that he wrote them a personal letter of thanks and enclosed a copy of his memoirs as a gift. For the sake of all its customers, Mercedes-Benz sells special-protection vehicles only after verifying the prospective buyer's credentials. Great importance is attached to confidentiality. Even when a new vehicle is being custom-built in the "Manufaktur", the engineers and fitters are unaware of the identity of the customer on whose vehicle they are working. Specially protected vehicles from Mercedes-Benz are very durable, with operating mileages of 400,000 to 600,000 kilometres not unusual. 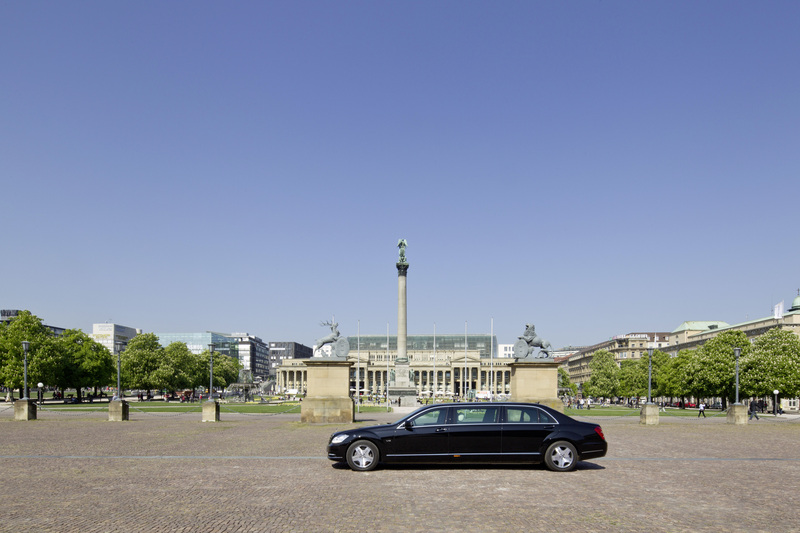 The W 126 once used to carry the German Chancellor, and now in the Mercedes-Benz Classic vehicle collection, has covered more than 600,000 kilometres. And in television reports from overseas countries it is still possible to see examples of the same model on official government business. Even after many years on the road, Mercedes-Benz special-protection vehicles are often given a new lease of life. After being returned to the factory and undergoing extensive refurbishment by specialists, they are almost like new and can be resold. This is only possible because, rather than weakening the structure, the special protection components which were integrated in the bodyshell when the vehicle was originally built actually strengthen it. Anyone who uses special-protection vehicles needs to know how to handle them, as they are significantly heavier than their series-production counterparts. This is why Mercedes-Benz, in addition to building and maintaining the vehicles, supports their drivers as well. 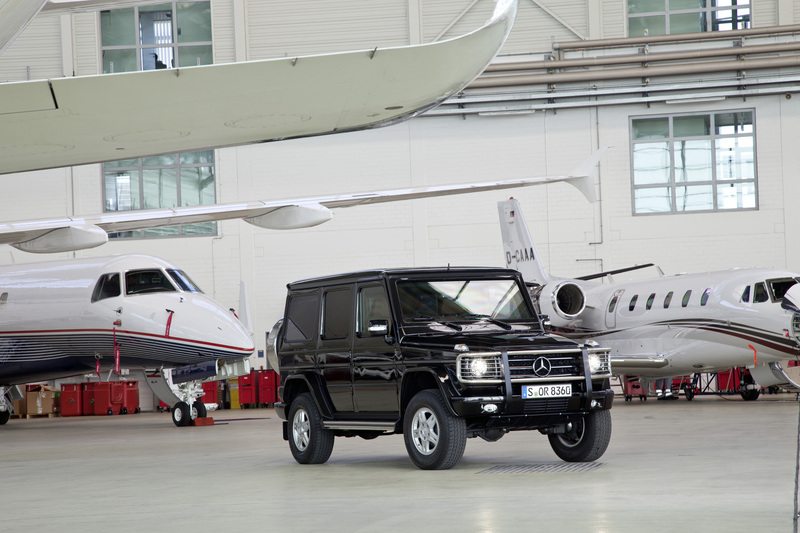 Since 1993, the brand has offered every buyer of a special-protection vehicle a sophisticated driver training programme, during which the chauffeurs learn how to make optimum use of their cars in every situation.